Hardcover, 9 in. x 11 3/8 in. This the complete story of how Jaguar helped pioneer and build the imported car industry in America. 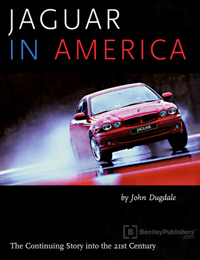 From his experienced perspective, John Dugdale showed how Jaguar built it's largest market, survived business reverses and always came back to new success, suppported by a network of American enthusiasts, owners, businessmen and financiers. He brought home the fact that throughout the company and its associate agencies, distributors and dealers there was always a love of the marque that sustained the relationship through the bad years and the good. From the early struggle to the racing championships and sales records; it is here. The original account covered the exciting growth of Jaguar from 1948 through the end of the 1980s, a time when Jaguar, after a brief few years as a public company, was hit hard by the 1987 financial crash and found it necessary to look for a partner. They found a powerful ally in the Ford Motor Company which made an offer for Jaguar in December 1989 and took over the company early in 1990, as covered in the Epilogue. In the final decade of the 20th century, Jaguar, backed by Ford, has been rising rapidly towards its full potential as a carmaker. Starting in 1990, Mike Cook takes up the narrative and shows how the company survived the disastrous loss of sales in 1990 through 1992 and, beginning with the X300 in 1995, has produced a stream of successfull new models, breaking into new marketing areas but never losing sight of its heritage. A veteran Jaguar employee and expert on the marque, he continues to tell Jaguar's story from the inside.